Situated right in the heart of Courtenay Place, Sahara Cafe requires only a late night stumble or two in the right direction. Sahara Café, by virtue of its dining options (ie. kebabs), must be touted as a destination for drunken dining as we all know that the mighty kebab is the king of all intoxicated cravings. 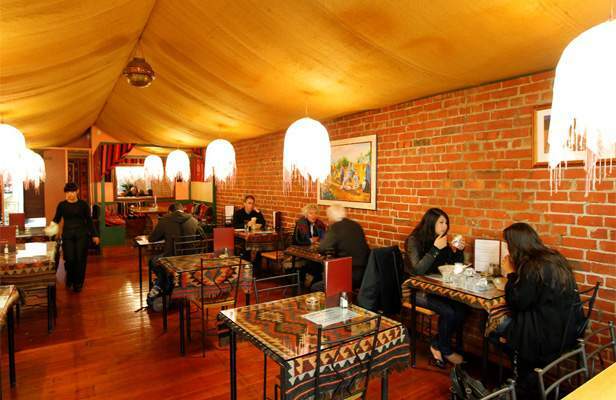 Its location also adds weight to its value as a venue for a drunken feast as it is situated right in the heart of Courtenay Place, meaning that getting from the clubs to a kebab requires only one stumble in the right direction. However, there is so much more to it than that. Namely, its roof is a tent, and this fact just cannot be understated. It makes the restaurant only seem authentic (truly authentic would involve a lot more indoor smoking, crackly TV and very sugary black tea), but it makes for a fun dining experience which is a bit different from the standard. There is a wide range of food options at Sahara Café, all of which sound phenomenal. These include the lamb tika; succulent and spicy pieces of char grilled lamb ($21.50), qallya; pieces of lamb aromatised with Middle Eastern spices, sautéed with potatoes and capsicum ($21) and the arba ello; chicken tender breast stuffed with ham, braised in white wine ($22.50). If you are determined to stick to the classic kebab though, you have yourself a sure-fire winner. The chicken and falafel kebab ($12) was enormous, had a perfect ratio of salad to meat, and fillings to sauce, was tightly wrapped, hot and flavoursome. So however you choose to visit Sahara Café, be it fresh faced or at the wrong end of a night out, you are sure to be well taken care of. Under that fantastic tent roof one can sit at an authentically wrought iron table, and chow down on a great meal in what is as close to Istanbul as you’re going to get on the golden mile. You intrepid traveller, you.